2020: Jan 11, Feb 15, Mar 14 - Any other Saturday on request. 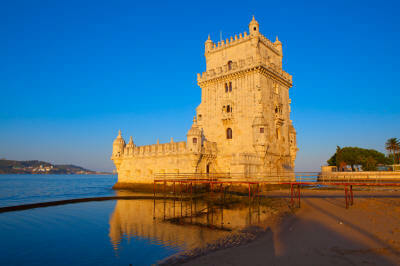 Departure Lisbon and drive to Óbidos, the city surrounded by medieval walls. Admire the harmony of the architecture, the diversity of the handicrafts and taste the famous ginginha (bitter cherry liqueur).Visit Alcobaça and the first and largest gothic church in Portugal with the tombs of D.Pedro and Inês de Castro, known by it’s love story. Stop in Nazaré a typical fishing village and seaside resort, with its traditions and legends. After continue to Batalha and visit the Monastery of Santa Maria de Victoria, a masterpiece of the gothic in Portugal. Here you can find the tomb of Henry the Navigator, the promoter of the maritime discoveries. After arrive in Fátima and see the famous Marian Shrine. Posibility to assist the Candle procession. Fátima- overnight. After breakfast departure towards Coimbra and visit one of the oldest University in the world, with its magnificent baroque library and its unique atmosphere characterised by ancient traditions and customs. Stop at St Clara Church, where lies the tomb of Queen St. Isabel, the protagonist of the “miracle of the roses”. See the exclusive ceramic of Coimbra. In the afternoon we continue to Aveiro, the city of the canals, known as the “Portuguese Venice”, where you shall have time to see the graceful boats “moliceiros” and taste the local sweets “ovos moles”. Drive to Oporto and Overnight. Palace of the Dukes of Bragança, which original building dates back to the 15th centuries. Drive to Braga known as the "Portuguese Rome" for its concentration of religious architecture, as the oldest Cathedral of the country, and the “Bom Jesus do Monte” Sanctuary with famous baroque stairway and gardens. Return to Oporto for overnight. Breakfast at the hotel before setting off for Santiago de Compostela, the capital of Galicia and the centre of pilgrimage at the end of the Santiago Way. In 1985, UNESCO declared Santiago de Compostela World Cultural Heritage and you have the entire day to freely discover this fascinating city. Wander its historical streets and learn about its most extraordinary monuments before sampling some of the traditional local dishes. Overnight in The Sheraton Hotel, Oporto. Morning departure to Amarante, a pretty town proud of São Gonçalo known for the promotion of love and marriage. The monastery houses his tomb and his lively bustling market where you can find fruit, vegetables, chickens, cloths, and an immense variety of other popular items. After, drive to Vila Real and visit the gardens of the manor of Mateus, which façade is still depicted on the well-known Portuguese Rose wine bottles. Then we enter in the Port wine region, travelling through the vineyards and the breathtaking landscapes of the Douro Valley .Stop in Lamego, and see one of Portugal's most important shrines . Remédios with its magnificent baroque style staircase.Maybe you will try some of the local delicacies such as the local ham or the famous “Bola de Lamego” (a loaf baked in the oven with smoked ham). Continue to the mountainous hinterland to Viseu, center of the Dão Vineyards and a city connected with Portugal´s oldest hero, Viriato, the Lusitanian chief. In the shadow of the Cathedral, narrow streets and doorways with coats of arms carved in granite make up the ancient town of Viseu. Along the center we find a busy commercial area. Later on arrive to Urgeiriça and overnight. Breakfast at the hotel. Departure towards to Sintra for a luxury day. Visit the palace of Sintra and walk through this charming village. Enjoy a the amazing view from the westernmost porint of Europe (Cabo da Roca). Along the cost we pass by one of the most famous surfing beaches, the incredible Boca do Inferno, the cosmopolitan Cascais and the gardens of Estoril Casino. Return to Lisbon. Lisbon- overnight. Today say farewell to the Algarve and return to Lisbon. On the way visit the city of Setubal, a major port and industrial center on the north bank of the Sado estuary. Then the scenic route over the Arrábida Mountain Range, an area preserved as a NaturalPark, with an amazing scenery and unique vegetation at the gates of Lisbon, and savor the sweeping views of the Tróia Peninsula. Crossing the bridge over the Tejo River, arrival to Lisbon. Continue with one of our Douro river cruises. Tour departs 9am from Marques de Pombal square in Lisbon or free pick up from Lisbon hotels.